LAS VEGAS – Pineapple Electronics’ Rumble KW Headphones have an unusual design, which makes them 100 percent waterproof. Unlike most other earbuds, the Rumble KW Headphones are good for swimming laps, snorkeling, or just taking a shower. The in-ear style buds create sound not through sound waves, like traditional headphones and earbuds, but through bone conduction. The Rumble KWs vibrate bones in the listener’s skull, creating sound in the inner-ear. 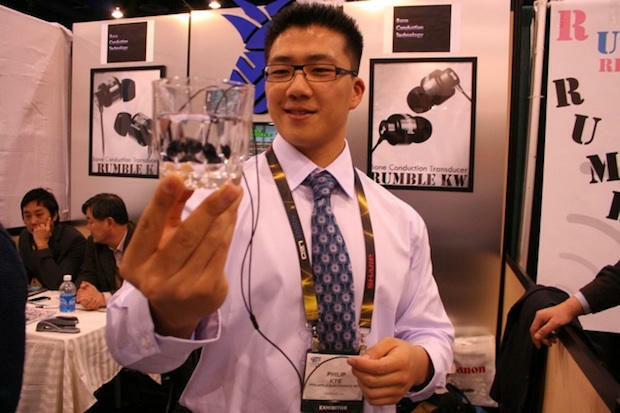 “See, it has no holes whatsoever,” said Pineapple’s Philip Kye, as the Rumble Headphones played in a glass of water. On the show floor of CES, the KW’s sibling headphones — Pineapple’s Rumble K Headphones, which aren’t waterproof — sounded pretty good, if a little muddy. The bass is outstanding, and they create a freaky buzzing and thumping in your ear.”The technology is tuned for lower frequencies, more bass,” Kye said. The KWs are limited to 100 decibels, so can’t damage the listener’s hearing. They seemed well-suited for gaming — or listening to music while cleaning the hull of a boat.